This was an interesting day for me. 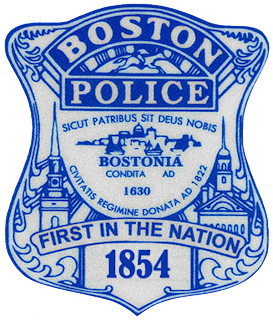 It began with a Moyers & Company podcast interview with Sandra Steingraber about her fight with the "authorities" (a.k.a. the law) concerning the environmental dangers associated with fracking. I came home with a heightened respect for civil disobedience. After my walk, I talked with my mother who has just come through a situation involving her legal right to have a ramp remain attached to her building. The law states firmly that if a person with a disability needs equipment to make it possible for him or her to enter his or her home, that person has a right to install it (or in my mother's case have it remain in place). My mother said that this episode reminded her that her youth was well spent. When she was young (i.e. my age), she worked for an organization dedicated to claiming rights for people with disabilities. She went to a lot of sit-ins and engaged in a respectable amount of civil disobedience. Her activism caused laws like the one cited by her lawyer to be put in place. We are faced with some really difficult problems in our corporately-controlled world, and if we all don't do something to fight the injustices (and in Sandra Steingraber's case, the toxins) that threaten us in more ways than we can imagine, there's no hope for the future. I'm sharing the above link, and I'm also sharing this video from Mayors Against Illegal Guns because I can. Please share it with your friends. Fran Lebowitz talks here (about 3 1/2 minutes into the clip) why there is so little that's new in current culture. I wonder about the idea of "something new" in music and art (or in "non-popular" culture). When I hear something old that I have never heard before, it is something new to me. Maybe my experience might be like the above artist for whom 100-year-old surrealism is a new medium of choice. The Picasso exhibit at the Art Institute in Chicago is loaded with all sorts of pieces by Picasso that were new to me when I saw them last month, but they were works he made a long time ago. The excitement of that "newness" is just as exciting for me as discovering new works by a young artist who is not as well known as Picasso and is currently making art. Unfortunately I tend to find that "something new" more often in works by older people or people who are no longer alive than in people who are young (though art by young children nearly always feels new and exciting to me). "Something new" doesn't have to be presented in a totally abstract way. Something new happens every time a baby is born, every time two people fall in love, and every time that winter gives way to spring, and things begin growing. "Something new" happens every time a piece of music is played by a living breathing musician (no matter how old the piece might be, or how many times it has been played). "Something new" can happen in a piece of newly-written music that uses instruments in much the same way they were used 100 years ago. "Something new" can even be made of the same kind of harmonic material that composers used over 100 years ago. Fran Lebowitz was born on October 27, 1950, and Oscar Wilde was born October 16, 1854. They are nearly a century apart, but so close not only in spirit and wit, but in looks. Wow. "An odd pair of second raters." Now that I've worked my way through Brahms, I've fallen back on Bruckner again. An odd pair of second raters. The one was "in the casting ladle" too long, the other not long enough. Now I stick to Beethoven. There are only he and Richard--and after them, nobody. The reference to the "casting ladle" is a reference to Act five, scene four of Peer Gynt. The "Richard" Mahler refers to is, of course, Wagner, and not Strauss. So who did Mahler think was in too long, and who not long enough, and why? "a puny little dwarf with a rather narrow chest"
I have gone all through Brahms by now. All I can say of him is that he's a puny little dwarf with a rather narrow chest. Good Lord, if a breath from the lungs of Richard Wagner whistled about his ears he would scarcely be able to keep his feet. But I don't mean to hurt his feelings. You will be astonished when I tell you where I get more completely bogged down than anywhere else--in his so-called 'developments." It is very seldom he can make anything whatever of his themes, beautiful as they often are. Only Beethoven and Wagner, after all, could that.
. . . 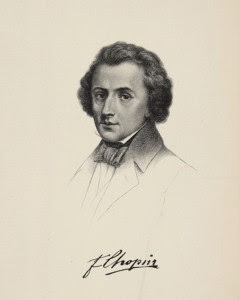 So you think you know something about Chopin? Try your hand at these quizzes! And then there's the Chopin-specific "name that tune." "Are they all fools or am I a fool?" We went to Tristan und Isolde this evening. It is the most repulsive thing I ever saw or heard in my life. To have to sit through a while evening watching, listening to such love-lunacy till every feeling of decency was outraged, and to see not only the audience but the musicians delighted with it was--I may well say--the saddest experience of my whole artistic career. I held out till the end, as I wished to have heard it all. Neither of them does anything but sleep and sing during the second act, and the while of act III--quite forty minutes--Tristan occupies in dying--and they call that dramatic!!! Levi says Wagner is a better musician than Gluck. . . Are they all fools or am I a fool? The subject seems to me so wretched: a love-madness brought about by a potion--how is it possible to take the slightest interest in the lovers? It is not emotion, it is a disease, and they tear their hearts out of their bodies, while the music expresses it all in the most repulsive manner. I could go on lamenting over it for ever, and exclaiming against it. This brought tears to my eyes . . . 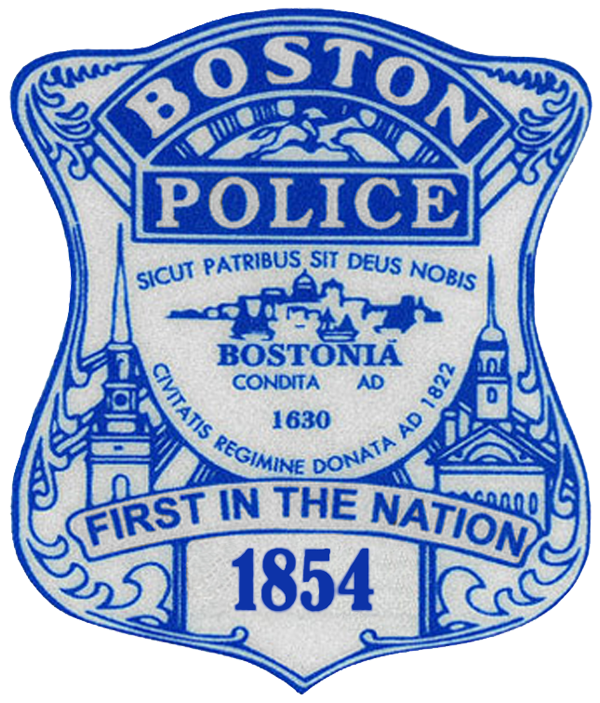 I may have spent most of my adult life in Illinois, but I'll always be a proud Bostonian. This heartfelt singing is from tonight's game. Everyone there understands how singing together helps express the shared feelings that we otherwise cannot express. I don't know if it is possible for any creative person to properly evaluate his or her own work. I certainly am not able to do it. I can be proud of having written something that has all the pitches and rhythms in the "right" places, and if somebody likes what I have written, I can be pleased that it gave (or gives) him or her some pleasure. Beyond that it is really not my place to say whether something I write is "good" or not. Anyway I believe that the real value comes when somebody plays what I have written, and when somebody plays a piece I have written really well, I tend to give the credit to the interpreter. The music itself can only be what it is, and it is (thankfully, when I'm not playing) not my job to determine what that might be. Every piece of music is incomplete until it is interpreted. Every piece of music can be interpreted in many different ways. Perhaps the best measurement of the quality of a piece of music is how personally it can be interpreted and still make linear sense. Perhaps music making and playing is a bit like sewing. It takes a lot of know-how, patience, time, material, equipment, vision, experience, and talent to sew an article of clothing. That article of clothing is meaningless if it sits on a hanger. It can only be useful when someone wears it, and because people come in all shapes, sizes, and colors, that piece of clothing will look very different on different people. People also wear different kinds of clothing for different kinds of weather and different circumstances. It is my job as a composer to make sure that the pieces I write fit the "contours" of the people who might want to play them, otherwise nobody will. I have clothes that I'm happy to wear around the house. I wouldn't wear them when I go out to dinner or out to teach. I also have pieces of music that I play every day and would never want to perform in public. Just because I'm not practicing something for a performance doesn't mean that it isn't a fully-functioning piece of music. Composers today seem to put such a great emphasis on "getting" performances. I like hearing people play my pieces as much as any other composer, but I would be just as happy if the music I have written ends up mostly as something that people play at home with their friends, and without an audience. Is a piece that people play for fun and personal expression less of a piece if it's not being performed for others? Everything in my musical life has had its ebb and flow. My most exciting period of "flow" happened in my very early 30s, after I made my definitive switch from flute to violin and viola, because I suddenly had all sort of musical opportunities and challenges to keep the musical parts (i.e. the non maternal) parts of myself occupied and stimulated out here in the "hinterlands." The next exciting period of "flow" happened for me when I started making arrangements for string quartet of pieces people wanted to have played at weddings. 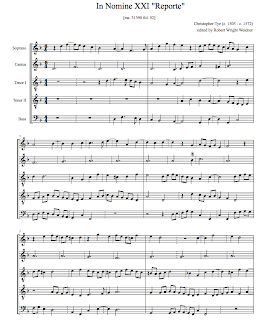 Once I became competent at making arrangements, I started writing music of my own, and 100 or so quartet arrangements and another 150 or so original pieces later, I have a pretty hefty body of work for lots of different instruments and voices. For at least a dozen years the wedding quartet work was plentiful, but thanks to gig master (which encourages musicians to compete with one another for work), as well as the economics involved with wedding planning (something I'm starting to understand more clearly these days), only a scant handful of people seem to want string quartet music at their weddings in my area. That part of my life is in a major state of "ebb." 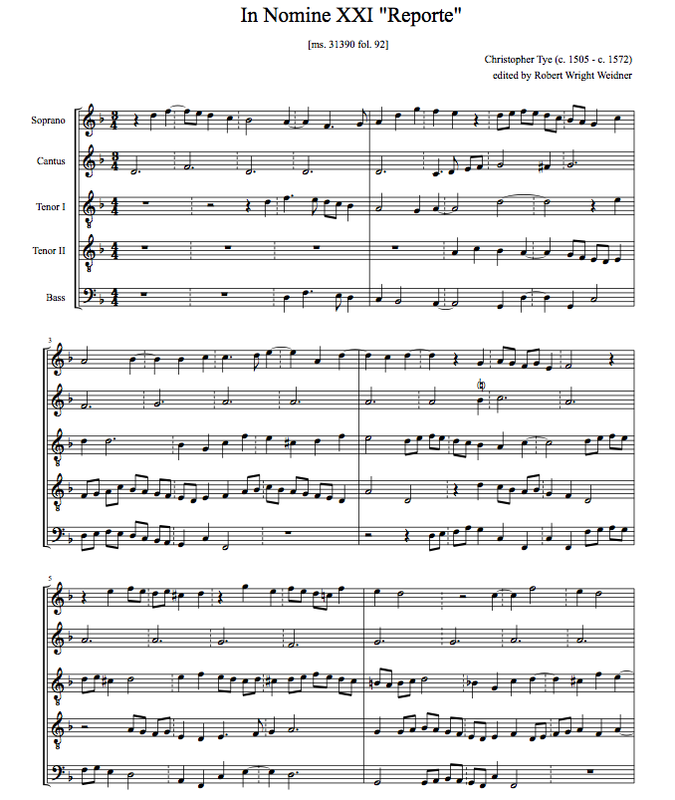 My arrangements aren't doing anyone any good festering on my computer, and publication is logistically out of the question (much of it is popular stuff--or once-popular stuff), so I have decided to make my string quartet arrangements available on line to anyone who wants to play them. I have loaded them into a dropbox folder to share. Why do I share my work like this? I do it to try, in my own small way, to make up for some of the terrible imbalances in a largely greedy and self-serving world. Its also a way to be involved (even if it is only passively) in more lively musical communities (wherever they happen to be) than the one I find myself in. Please send me an e-mail message (elainefine [AT] gmail [DOT] com) if you would like to be invited to join this dropbox folder. The arrangements are entertaining for audiences, and they are a lot of fun to play. "The Power List: Why Women Aren't Equals in New Music and Innovation"
Everything Ellen McSweeney says is true, and the comments are interesting as well. Simon Morrison's Lina & Serge looks at the life and times of Serge Prokofiev through the eyes of Lina, his cosmopolitan wife, who was born in Spain, and lived in high style in New York, Paris, Geneva, Tzarist Russia, and who struggled through life in Soviet Russia, eight years of which she spent as a prisoner in the gulag. Lina (1897-1989) was a singer (and in all probability not a very good one). It is pretty clear that Serge Prokofiev's attraction to her had a lot to do with her beauty (and she was beautiful), and the fact that she was willing to have a physical relationship with him without being married. He only consented to marrying her after she became pregnant with his first son, and was a terribly distant father to both of their children. Serge Prokofiev's return to Russia (he met and married Lina in the West) was an opportunistic move on his part, and Lina and the children did their best to survive while conditions continued to crumble. 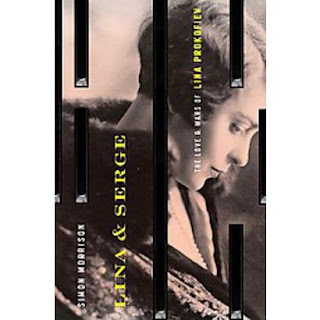 Eventually Serge, who did benefit professionally from the Soviet system, fell under the spell of a Mina, younger woman who was intent on breaking up his marriage with Lina and marrying him herself. When the Soviet government decided that the marriage between Lina and Serge was invalid because it was not a Soviet marriage, Serge was free to marry Mina. Lina was given work as a translator, and eventually government officials arrested her because of suspicions they had concerning her occasional meetings with foreigners (people she knew who were visiting the Soviet Union). She was sent to the gulag for eight years, and only obtained her release through the kindness of Dmitri Shostakovich. Three years after Serge's death (Serge died on the exact day and at the exact time as Josef Stalin!) the revocation of her marriage was reversed, and Serge Prokofiev became a posthumous bigamist. This is one of the best composer biographies I have read (and I have read a lot of composer biographies). It describes the environment around Serge Prokofiev in believable intimate and personal detail (Morrison had a great deal of source material, and close contact with the family), even though the material he presents seems like a great piece of fiction. As a man Serge Prokofiev is still a puzzle to me, but he was also clearly a puzzle to the people who knew him well. Morrison puts pieces of music into the context of Prokofiev's life, and he does so in a way that makes perfect sense. He presents everyday life in the Soviet Union in a way that rings frightfully true, and he describes (through Lina's eyes) the presence and importance of music in the gulag, something I could never have imagined. When she was released from the gulag, Lina had to sign an oath of silence. I'm glad that she didn't honor it. 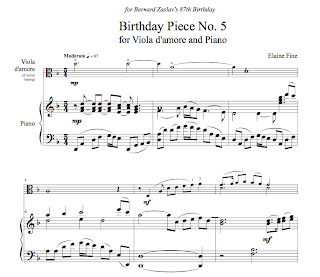 I'm a little ahead of schedule on my yearly birthday pieces for viola d'amore and piano, but this one serves two purposes: to mark my upcoming birthday at the end of the month, and to celebrate Bernard Zaslav's 87th birthday today. Notice that the meter is 5/4 and the piece has 54 measures (I'll be 54 on April 30), and the tempo is 87 to the quarter. 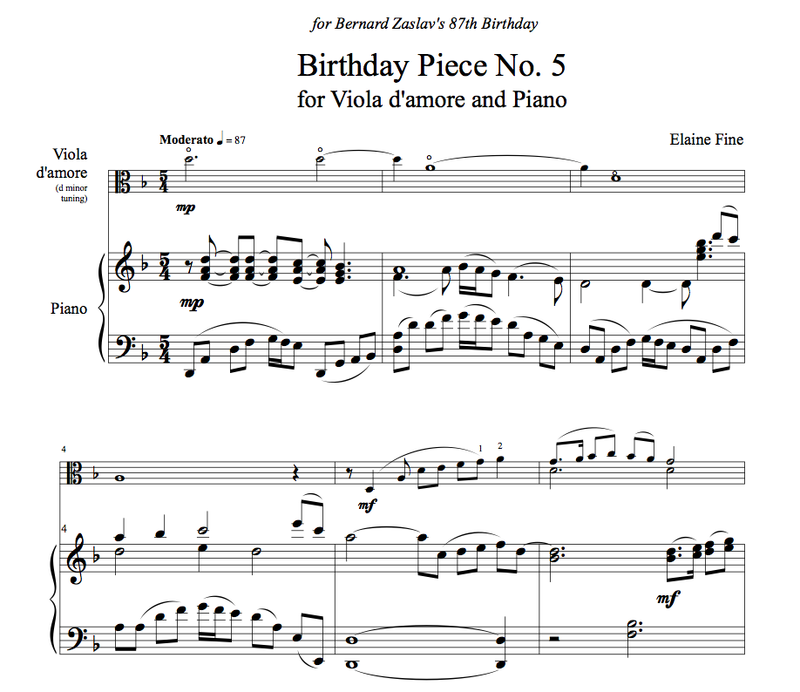 I finished writing the piece in time for Bernie's birthday, but it will take ma a while to learn to play it, so a computer-generated version will have to do for the time being. Veronika, der Lenz is da! 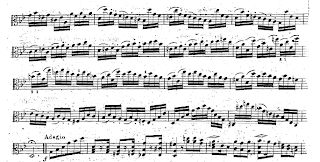 Bartolomeo Campagnoli (1751-1827) published his Opus 22 Capricci for solo viola in Leipzig in 1815. They are important etudes for the viola because they are original for the instrument, and they are rewarding to practice. There isn't much known about Campagnoli, though I did read somewhere that he was one of Rodolphe Kreutzer's (1766-1831) teachers, and it is certainly possible that Campagnoli learned some of his craft from Tartini, either through personal contact or through his music. 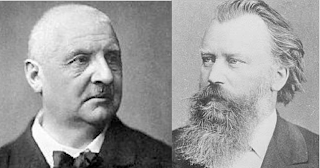 makes the relationship between these two composers abundantly clear. I imagine that Kreutzer figured that Campagnoli's technical paramaters for the viola (i.e. 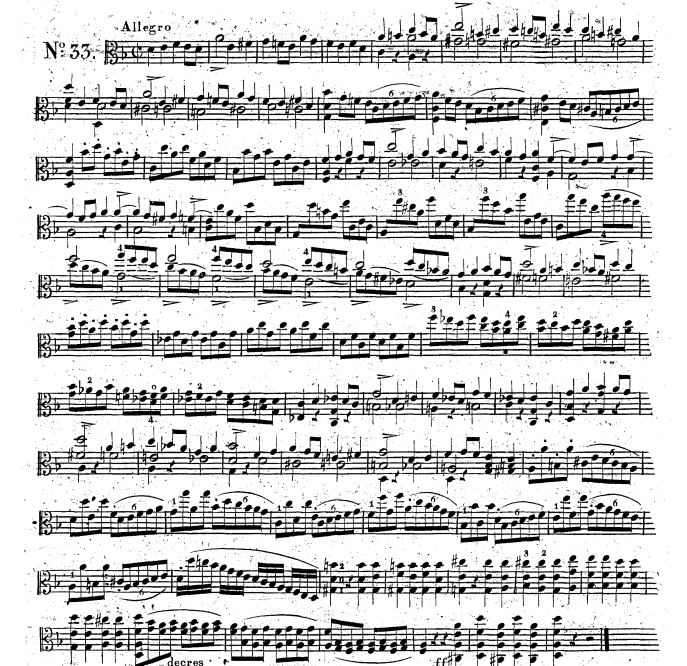 writing etudes that would build technique and not cause injury) would be just right for an all-purpose intermediate book of etudes for the violin. There is no doubt in my mind that he pilfered passages here and there. 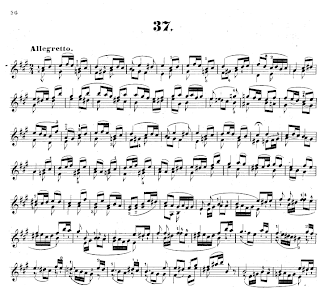 Even though they were published in Bonn in 1802, only a few violinists knew about Johann Sebastian Bach's Sonatas and Partitas. 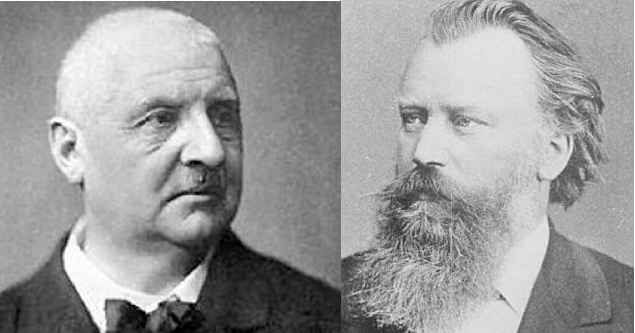 They weren't really known until 1943, when Ferdinand David made his edition; and even then they were not well known until they were performed by the famous Joseph Joachim. 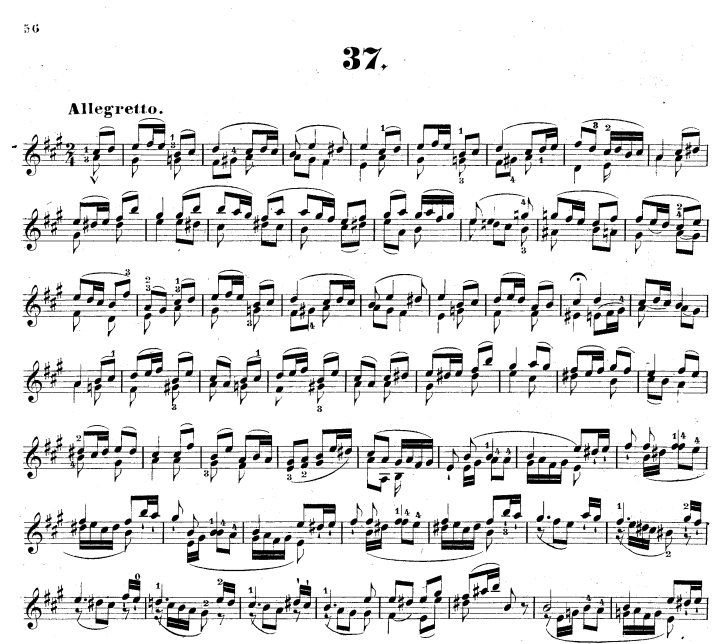 I used to think that Kreutzer might have been one of the few violinists who had the 1802 publication because of how Bach-inspired his 37th Caprice sounds. 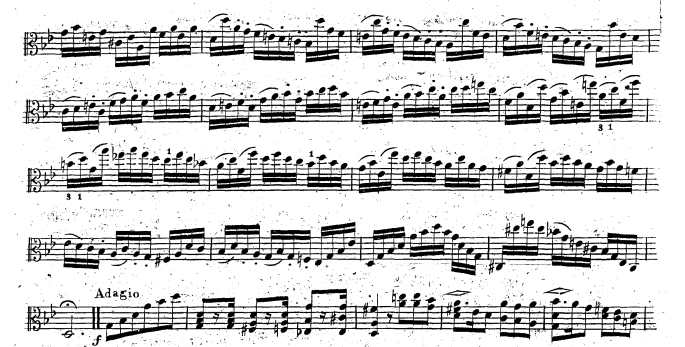 But then I noticed that Campagnoli's 33rd Caprice for viola is practically a study on Bach's C-major Fugue. This makes me wonder if it it was Campagnoli and not Kreutzer or David who was the 19th-century's first window to the solo violin music of Johann Sebastian Bach. 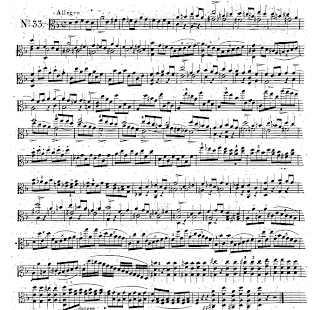 Here's a link to the first publication of the Campagnoli Caprices, and one to the 1850 publication of the Kreutzer Caprices. It sounds like an April Fools joke, but it isn't! This piece by the Renaissance composer Christopher Tye (c. 1505-c. 1572) is the last of a set of 21 instrumental pieces that share the same cantus firmus. They begin simply, and become increasing complex as they go along. In this, the final piece of the set, Tye puts the two upper voices in 3/4 time, and the three lower voices in 4/4 time. I imagine he amused (or perhaps frustrated) his friends with this.